Maybe President Trump had a point when he blasted his Canadian counterpart, Justin Trudeau, for being "very dishonest and weak." Canadian Prime Minister Justin Trudeau, who earlier this year survived an embarrassing #MeToo scandal when a woman accused him of groping her at a party, is once again following President Trump's lead by imposing business-friendly tax cuts meant to spur economic growth and investment instead of using it to cut Canada's budget deficit. The tax cuts, according to Trudeau's government, are intended to help drive business and economic growth over the long term (sound familiar?). Trudeau’s finance minister, Bill Morneau, introduced the corporate tax breaks - which will be worth some C$14 billion ($10.5 billion) over the next six years - in a fiscal update released Wednesday in Ottawa. According to Bloomberg, the cuts represent the Trudeau government’s biggest gift to Canadian businesses since taking power. Here's how they will work: By allowing businesses to write off capital investments more quickly (particularly in manufacturing), businesses will be further incentivized to invest in expansion, which in turn should help improve competitiveness, as worries about Canadian businesses' ability to compete with the US (thanks largely to Trump's pro-growth policies) have intensified. "This incentive will encourage more businesses to invest in assets that will help drive business growth over the long term," Morneau said, according to prepared remarks. "Because our economy is doing well, we also have the fiscal room to follow through on the commitments we made." ...Which is reeling as the price of Canadian oil has tumbled back below $20 a barrel amid a worsening supply glut. The tax cuts are being implemented as government revenues are rising. But the country's budget deficit is rising as well - something that could become an issue for Trudeau during budget season next spring. He will also be running for reelection in 2019, and unless Canada's legal pot sales can plug the entire hole, his ability to chart a path back toward fiscal restraint could become an issue. The cuts will total C$83.5 billion over five years, up from C$78.3 billion forecast previously. While the cuts effectively hand more money back to Canadian companies, Trudeau's Liberal Party has resisted cutting the corporate income tax rate (preferring to sneak its corporate handouts in obscure "budget updates" that will likely go unnoticed by the Canadian public at large). But given that the expected 2018 budget deficit is expected to be lower than the C$18.1 billion projected, Trudeau and company figured they could get away with providing some additional fiscal stimulus. However, these cuts could come back to haunt them down the road, as Canada's government is expected to run bigger shortfalls over the four following years. Its total debt burden is projected to rise to C$765 billion by 2023-24, from C$688 billion in 2018-19 while the ratio of debt to GDP is expected to fall to 28.5% in 2023-24 from 30.9% in 2018-19. 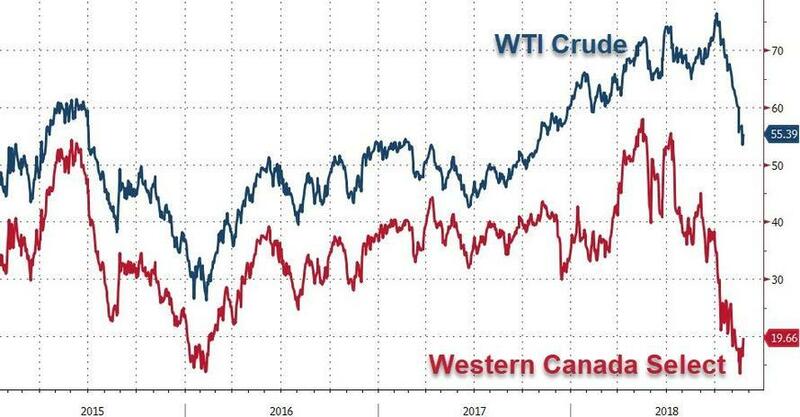 But hopefully, Trudeau will have succeeding in making Canada great again long before then, and he can ride a growth boom in Canada's energy patch to another term in office.